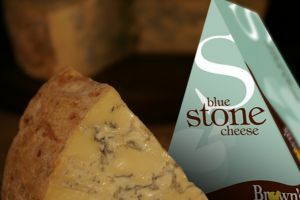 A mild ‘mushroomy’ blue cheese, soft when ripe, which can take up to two months or more, check the date of manufacture. We sell in either a half round cheese or as a portion. Store in your refrigerator at 4°C. A robust rich blue cheese. This cheese is a wonderful addition to a cheese board, and a great special occasion cheese as a half round, catering for a lot of hungry people is easy and makes for a good social time as the cheese lovers gather round. We also sell it as a portion. Stone always leaves us ready to eat, so it is best to buy it from an outlet that obviously has a good quick turn over and good cold storage. Many people wonder why it is called ‘Stone’; It looks like an old rock is the answer.